Johnathan Wong is the first Malaysian shooter to qualify for Rio Olympics. In a thrilling final at the Dr Karni Singh Shooting Range, the 24-year-old Johnathan came out tops after collecting 198.70 points, just 0.40 points ahead of silver medallist Alanazi Atallah of Saudi Arabia. North Korea’s Kim Jong-su bagged the bronze with a score of 176.90. Johnathan had earlier made it to the top-eight final by virtue of finishing third in the 50-man field with a 578 total. Johnathan, indeed, led the match for its entire first half, building a comfortable 2.6-points advantage along the first 5th series, but nailing a disappointing 8.2 on his 13th shot. In the next following three series, then, Atallah got closer to his rival eventually claiming the lead after the 18th shot. In the last series, anyway, Johnathan hit an excellent 10.7-10.3 combination, overtaking Atallah and pocketing the Gold medal with 198.7 points, also earning the first Olympic quota place up for grabs in this event. “I am floating on air right now. My Olympic dream has come true. 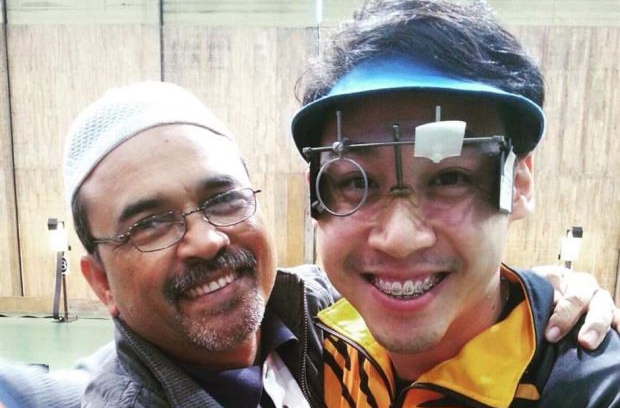 I am glad that Malaysian shooting will have a representative in Rio,” said Johnathan excitedly. “Only two tickets were up for grabs in my event. When I reached the final, the Olympic ticket was already in my hands." “After that, my team-mates and coaches were cheering for me to get the gold. They looked more nervous than me in the final. It was tense but I stayed steady in my last series to shoot 10.70 and 10.30 to nick the gold,” said the shooter who trains under former international Hashim Desa. He will be the fourth Malaysian shooter to feature in the Olympics after Bernard Yeoh (trap - 2004 Athens), Hasli Izwan Amir Hasan (pistol - 2008 Beijing) and Nur Suryani Taibi (rifle - 2012 London). Johnathan has been making his mark as the national men's shooter, having qualified for the 2014 Glasgow Commonwealth Games and 2014 Incheon Asian Games. He finally had his major breakthrough, after winning the silver medal at the 2015 Southeast Asian (SEA) Games. Johnathan Wong at the Singapore SEA Games back in June 2015. Johnathan was on his way to clinch the gold medal at the 2015 Southeast Asian Games in Singapore last June, only to lose out after he misfired his last two shots to end up with a silver. A few months later, he made no mistake to break his own national 10m air pistol record at the Tun Hanif Trophy in Subang on September with a 585 total in the qualifying rounds. He went on to break his own national record again in December after collecting 201.50 points in the final to win the event at the 39th South-East Asia Shooting (SEASA) Championships in Jakarta. The Malacca-born shooter who is currently studying at Universiti Putra Malaysia (UPM) is the sixth Malaysian to quality for the prestigious Olympic Games alongside divers, Ooi Tze Liang, Pandelela Rinong, Wendy Ng, Nur Dhabitah Sabri and archer, Khairul Anuar Mohamad. He's made every Malaysian proud. She hails from Tambunan and has impaired vision. Bet you didn't know Malaysians are super good at dodgeball too!